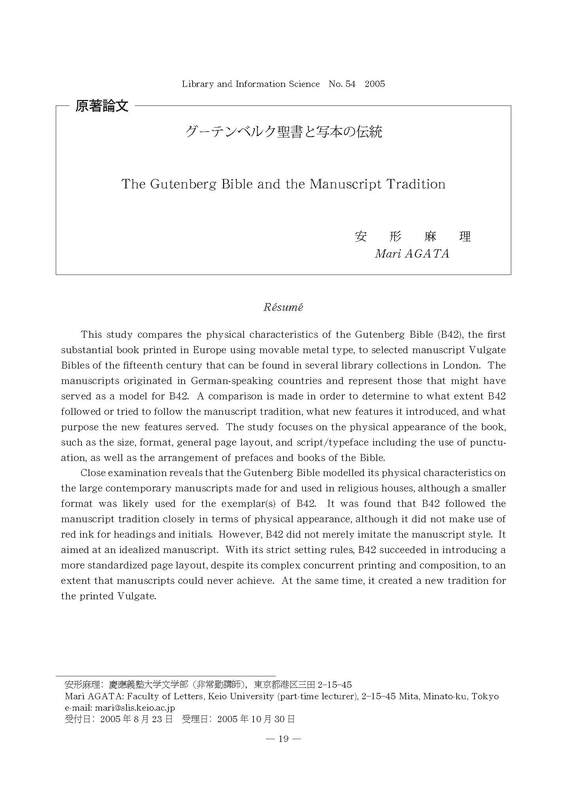 This study compares the physical characteristics of the Gutenberg Bible (B42), the first substantial book printed in Europe using movable metal type, to selected manuscript Vulgate Bibles of the fifteenth century that can be found in several library collections in London. The manuscripts originated in German-speaking countries and represent those that might have served as a model for B42. A comparison is made in order to determine to what extent B42 followed or tried to follow the manuscript tradition, what new features it introduced, and what purpose the new features served. The study focuses on the physical appearance of the book, such as the size, format, general page layout, and script/typeface including the use of punctuation, as well as the arrangement of prefaces and books of the Bible. Close examination reveals that the Gutenberg Bible modelled its physical characteristics on the large contemporary manuscripts made for and used in religious houses, although a smaller format was likely used for the exemplar(s) of B42. It was found that B42 followed the manuscript tradition closely in terms of physical appearance, although it did not make use of red ink for headings and initials. However, B42 did not merely imitate the manuscript style. It aimed at an idealized manuscript. With its strict setting rules, B42 succeeded in introducing a more standardized page layout, despite its complex concurrent printing and composition, to an extent that manuscripts could never achieve. At the same time, it created a new tradition for the printed Vulgate.